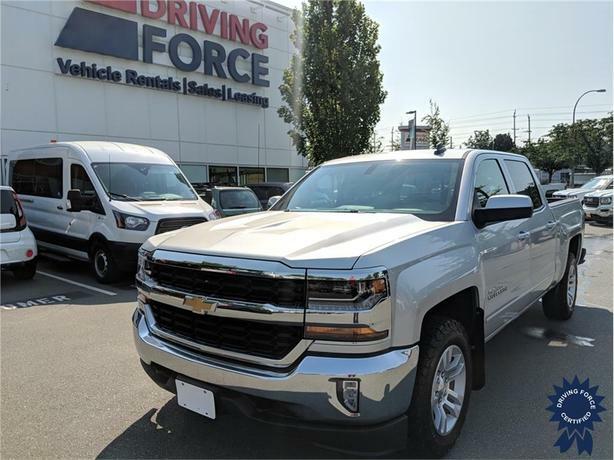 This 2017 Chevrolet Silverado 1500 LT True North Edition Crew Cab 6 Passenger 4X4 Truck has a 143.5-inch wheelbase, 5.5-foot short box, 3.42 rear axle ratio, 18-inch wheels, jet black cloth seat trim, trailering package, engine block heater, Chevrolet MyLink Radio with Navigation and 8-inch Diagonal Color Touch Screen, AM/FM stereo, heavy-duty locking rear differential, integrated trailer brake controller, thin profile LED fog lamps, 10-way power adjustable driver seat, heated driver and front passenger seats, remote vehicle starter system, dual-zone automatic climate control, rear-window electric defogger, WiFi hotspot, and GVWR rating of 7,200 lbs (3,266 kgs). The 5.3-litre Ecotec3 V8 with Active Fuel Management gas engine has 355 horsepower at 5600 RPM and 383 lb-ft of torque at 4100 RPM. For more information and details, please use our handy web form and one of our truck sales consultants will be with you shortly.